I have 4 blog post series almost done(PPTPlex, Illustrator-to-PowerPoint, Animation, and more), but I am in the midst of several LARGE projects overlapping right now that have every moment at the computer stylizing presentations. So check back this next Monday for things to be back on track with a lot of great posts rolling out one after another! PPTPlex – A New View of Presentations! Okay, this is some pretty cool stuff! Microsoft Labs (kind of an R-&-D group that releases software that MS makes no guarantees about or support for) has made a PPT 2007 add-in that changes the way you think about slide navigation. Imagine one slide having a dozen very very small thumbnail images of other slides and then those slides having even smaller thumbnail images of more slides. View the first slide, click on a thumbnail and zoom into it. Go through the slides in order or zoom back out to go to a different topic/section! This one is easier to see explained, so click here for movie overview. I will be experimenting with PPTPlex this week and should have a few samples posted. In searching for images for a current project I stumbled on indisain, a royalty free site that offers all images free of charge. You do need to register in order to login and download images (without a watermark). I found the variety good, but the image size varied from usable (1280px wide) to unusable (100px wide). Images are categorized, but limited search capabilities with categories. 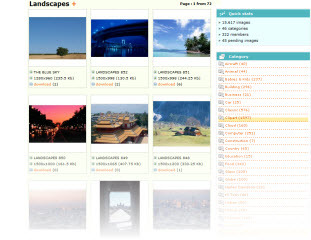 And some categories had more images than others, such as the landscapes category with 72 pages of images. If you need another image resource, you can check out indisain here. Two Versions Of PPT Installed? Launch ‘Wrong’ Version? I run multiple versions of PowerPoint on my systems – namely PPT 2003 and PPT 2007 (although a few have all versions from 97 to 2007). If you run multiple versions, then the new set of security updates from Microsoft yesterday probably changed your default application. I still have PPT 2003 set as my default version of PPT. But the latest security updates change the default application to PPT 2007. 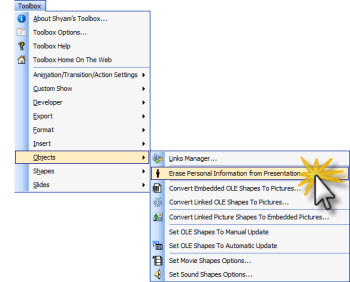 So now when I double-click on a presentation file it opens in PPT 2007. The fix is fairly simple – just click here for a post I made all the way back in ’06. This is a fun resource I discovered recently. 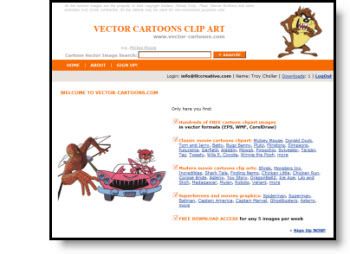 Vector-cartoons.com does require registering and has a weekly download limit. I was able to find exactly what was needed – as a high-quality fully editable vector image! Note: for PPT download the .wmf version (I downloaded the .eps, modified in Illustrator and then exported as a .wmf). 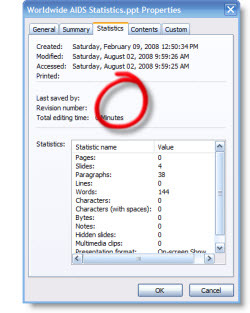 “The creation date, time and author show up on the document properties of the PowerPoint presentation.” (for the curious, you can read the full story here). 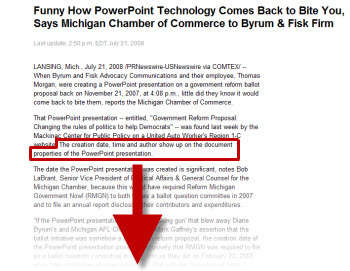 Have you ever been concerned with too much information being included in your presentation? Maybe even information that is not on a slide, but buried in a link or the file properties… I have for years tried to keep my clients out of trouble by removing often removing their personal information, or sometimes the TLC Creative Services information from the file properties. My tool for doing this – the Shyam’s Toolbox add-in. No the file properties are clear – no time stamp, no amount record of hours worked, etc. It is just one of the many tools in the add-in package, which runs approximately $50 – but it can be worth it as the above story points out! We often forget as individuals we can do a lot to make this world a better place and spend time waiting for the change to happen. Here is an initiative to prove it to ourselves that we can do as much as anyone to promote peace. 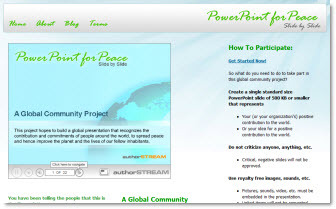 Glenna Shaw and Geetesh Bajaj, both PowerPoint MVPs have started a unique initiative “PowerPoint for Peace”, a Global Community Project. The project just last week and is building a universal presentation that recognizes the contributions and commitments of people from around the World to improve the planet and the lives of our fellow inhabitants. authorSTREAM.com is being used as a platform and participating is very easy. Just create a single slide that depicts a contribution that helps make the World a better place to live in (must contain your name/group/company and be uploaded using the authorSTREAM link). See it and participate here. If you are an Outlook user like me for email (my 12 year old daughter has no use for email that is not web-based on accessible from any connection or phone). I think this is a must have tool, and I am in good company as Mr. Bill Gates recently extolled its usefullness! Xobni is “inbox” spelled backwards. It runs along side Outlook, without touching any of its files (very important to me) and is viewed in a new column. 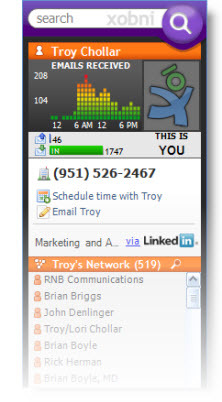 It adds information about who is emailing you, how to contact them, who you have mutually emailed, threaded conversations and more. 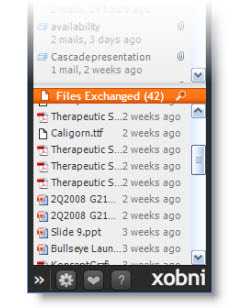 By far my favorite feature is the ‘Files Exchanged’ area that shows all of the attachments that person has sent me – which means no more hunting through old emails for that logo! It is FREE and works! Look at it here.